Contents: George Clooney in Geneva, Election night party with Zurich SP, Debate watch events in Zurich and Bern, Expat Expos in Zurich and Bern (VOLUNTEERS NEEDED), campaign gear, and DA Munich Oktoberfest. I have been very busy behind the scenes organizing events and creating campaign gear for our membership here in Switzerland/Zurich. We will be honored with the presence of Mr. George Clooney at a fundraising event in Geneva Switzerland on August 27th 2012. Please click on this link for further details (https://my.barackobama.com/GenevaAugust27Reception). I would encourage all who can attend to do so. It is a once in a lifetime experience and one that benefits our Party and President. 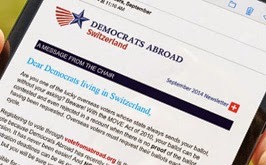 Although it is not a Democrats Abroad event, the host and organizer, Mr. Charles Adams, is a very important part of our Expat community and has previously afforded us opportunities to meet high-level persons of interest. I look forward to seeing you there. We are in need of volunteers for the Expat Expo in Zurich on the 2nd of September 2012 and the Expat Expo in Bern on September 23rd 2012 to assist with Voter Registration. The Expat Expos take place on Sunday. I am also pleased to announce that we will be once again be holding our Election Night event in Zurich in cooperation with the SP party of Switzerland on November 6th 2012. I am working out the details with the chair of the SP Zurich, Mr. Jean Daniel Strub, as we speak and will inform you in a timely manner of the details. We will be honored with the presence of the Mayor of Zurich, Mrs. Corine Mauch, who just happens to hold US/Swiss dual citizenship! Also in attendance will be leading Swiss intellectual journalist and movers and shakers, who are familiar with our country and her political system. Should (when) President Obama is re-elected; I am in negotiations with the owner of Café Conditorei, Schober Peclard, for our Inauguration celebration. We are also planning our Presidential and Vice Presidential debate viewing / discussion events. If anyone would like to volunteer to host such an event in their home/apartment please let us know as soon as possible. We are hoping to host simultaneous events in the Zurich /Bern areas, so that everyone will have the chance to come together and not have to travel long distances to participate . In Zurich we will more than likely be hosting our events at the American Women's Club of Zurich, as we tend to have attendees from all 3 parties and need a large space. If you would like to sponsor an event evening at AWCZ please contact me as soon as possible. The proposed dates for the debates are as follows: October 3rd, 16th and 22nd 2012 for the Presidential debates and October 11th for the VP debate. It has been stated that there will be at least 2 VP debates. I will pass the dates along to you as soon as possible. We usually try to hold our viewing/discussion events on Fridays, as this seems to be best for the majority of folks and because the actual debates occur live in the middle of the night CET time. Myself and René Malle are currently in the process of creating campaign gear for our Swiss membership as it is currently not possible to order overseas directly from the campaign due to campaign finance regulations. Our neighbors in Democrats Abroad Munich chapter are planning another fun Oktoberfest event on Sunday October 7th and we encourage all of you to join the fun and have some beers with Democrats from all over Europe! This event has been sold out every year before September so get your tickets soon before places run out. More details can be found here. We are planning further events and will announce them as soon as plans are finalized. Please feel free to contact us if you wish to organize an event and would need our assistance. We are encouraging everyone to get together to brainstorm and socialize with a purpose!! Due to the fact that our region (German speaking) is so large, we are asking our members to please help us to get out the word, host events and assist with Voter Registration / Phone Banking whenever possible. I hope to see our region well represented at the Clooney event in Geneva on 27th August and remember, going ''FORWARD'' WE GOT PRESIDENT OBAMA'S BACK!